Matt Stoller: Both parties have representatives at odds with leadership over role of the Fed. PAUL JAY, SENIOR EDITOR, TRNN: Welcome to The Real News Network. I’m Paul Jay in Washington. With Congress now back in session, an interesting debate is going to develop. There’s a split in both the Democratic Party and the Republicans over what to do about the Fed. On the Republican side you have the Tea Party types, both in the House and the Senate, who say get rid of the Fed, abolish the Fed. Within the Tea Party you have another wing. It’s the [Sarah] Palin side, which also has a big critique of the Fed, whereas the old guard Republican establishment clearly is on board with the Fed. You have a similar split on the other side, amongst liberal progressive forces, you have people who see a need to reform the Fed, democratize the Fed in such a way that it would be quite a different Fed, and others who are on board with the Fed. In fact, some have called [Ben] Bernanke a hero for saving the economy. Matt Stoller, who was a senior policy adviser for Representative Grayson in Florida, and particularly on economic issues like the Fed, wrote the following: "Liberals should stop their love affair with conservative technocratic myths of monetary independence, and cease seeing this Federal Reserve as a legitimate actor. At the very least, we need to begin noticing that these people do in fact run the country, and should not." Now joining us to discuss the Fed is Matt Stoller. Thanks for joining us. MATT STOLLER, BLOGGER, POLITICAL CONSULTANT: Thanks for having me. JAY: Talk a little bit about what you mean by the liberal love affair. STOLLER: Traditionally, liberals trust economists and experts. They trust the central bank. They trust the kind of New Deal economic structures which–you know, and the Fed is the central financing agent–or was the central financing agent of the New Deal. And what we’ve seen is that the bailouts and the financialization [inaudible] the economy, which is a more longer-term trend, 30, 40 years, have led to the undermining of the moral values of the New Deal. And so you see kind of a new generation or a new group of liberals who are saying, well, maybe these institutions, one of the main ones being the Fed, are not legitimate actors and are not serving democratic interests. And, you know, the flashpoint last year was the audit the Fed legislation. So you see, you know, technocratic economists who consider themselves Democrats defending the independence of the Federal Reserve. And these would be people in the Obama camp. And then you see people who are maybe a bit more–I don’t want to say radical, but people who believe that these institutions are not particularly legitimate, people like Dean Baker saying, hey, we need to find out exactly what happened during these bailouts, you can’t trust Bernanke, you can’t trust these undemocratic structures. And that debate has played out in the last couple of years and will continue to play out. JAY: And you had this division in both parties. You had, in the Republican Party, Ron Paul libertarian types allying with these sort of progressive economists demanding transparency in the Fed, and within both parties the old guard were not interested in that. STOLLER: Right. You had the sort of Judd Gregg Republicans, the various establishment Republicans who got very viscerally angry at the idea that one would question the Federal Reserve. And Kent Conrad on the Democratic side, the same thing. Tim Geithner, you know, Obama, they were all actually personally offended that anybody would question these institutions. JAY: So what do you make, then, if from the Obama camp’s argument and people who are applauding Bernanke, saying that the great lesson that was learned by Bernanke from the 1930s Depression was create as much liquidity is possible to avoid massive depression. Bernanke did that. And without a independent Fed who could have just done–who did just do it, more or less, in spite of Congress, you could have had a big depression, and they call Bernanke the hero for saving the economy. So what’s your response to that? STOLLER: That’s an insightful observation. And basically what President Obama thinks about the Great Depression, and Bernanke, is that the problem of the Great Depression is not that the elites acted badly and the economy fell into depression; it’s that Franklin Delano Roosevelt didn’t cooperate enough with Hoover. Obama a couple of months ago in a conversation with bloggers said that he wasn’t going to act irresponsibly in a crisis the way that FDR had. There was this really amazing moment that we don’t really hear about in American history when Hoover, after being destroyed in the election by FDR, kept trying to get FDR to appear with him, and basically pledged to creditors that they would be fully repaid, and to try to head off the New Deal. And Franklin Delano Roosevelt said, no, I am not going to take the powers of the presidency until I’m inaugurated and until I have the ability to exercise the full powers of the presidency; and until that happens, I’m not going to participate in Hooverite economics; I’m going to, you know, tread my own path. And that’s what he ended up doing, and the economy was collapsing and the banks were going under. And so a lot of conservatives blame FDR for the Depression, because they think that had he gone along with Hoover, they see it–they basically agree with Hoover. They think it was just a confidence problem, not fundamental structures of institutional corruption. And Obama agrees with those people. He doesn’t actually believe that the Depression happened because of corruption among elite economic structures. JAY: But what do you make of the argument that what Bernanke did, boldly, was put tons of liquidity [inaudible] we found out as a–partly as a result of this–part of it is this transparency, which you guys fought for–I mean you guys including Representative Grayson. JAY: You know, trillions of dollars of liquidity shoved into the global finance system. And they’re crediting that with, you know, putting a–preventing collapse. STOLLER: Well, so it’s important to understand what the Fed did and what Treasury did. Basically, during the collapse, you had the Fed being used as an off-balance-sheet financing vehicle for what Treasury wanted to do but couldn’t get Congress to go along with. So the Fed was used as a way to circumvent democracy. And the reason they wanted to do this, and what we learned when the Fed just recently had to disclose its emergency landing facilities and what was in them, is that the Fed lent out around $9 trillion to large banks, large foreign banks, hedge funds, and even just wealthy individuals. JAY: And large corporations–GM and other places. STOLLER: Large corporations, yes, yes, Harley-Davidson, you know, etc., etc. Wayne /"haI.zIN/ is just a rich guy. What you see is that the Fed basically created a two-tiered credit system, where if you were a subprime borrower and you had a house and you were placed into a predatory loan, there was no way you could get credit, even if your problem was a liquidity problem. But if you were–you know, you could say, I’ll pledge my house, and they’d say, ha, good luck with that. But if you were a hedge fund or if you were wealthy or if you were in the power class, then, you know, you could pledge anything. You could just say, you know, here’s a piece of toilet paper and I think it’s worth $1 million, and you could give that to the Fed and they would give you a $1 million loan with zero percent interest rate. And in fact, the Fed lent out about $1 trillion based on CCC collateral, which is a very, very poor quality of collateral. So they circumvented democracy to create a two-tiered credit system to give liquidity to the wealthy, when the only thing that mattered was actually liquidity. And this goes against all of the best tenets of central banking, and it did prevent a depression for the upper class. STOLLER: For the upper class so far, but not for everyone else. And so that’s–you know, what you’re seeing is the result of the policies that Obama wanted and that Bernanke wanted. Bernanke’s whole academic career is not about how to prevent another Great Depression; it’s about how to prevent another New Deal. JAY: The split on the Republican side, to what extent do you think–. First of all, talk a bit about the split, you know, talk about the–describe the different forces at play and how you think it’s going to play out. STOLLER: So I don’t know how that’s going to play out. I’m wary of predicting the future. You have institutional establishment Republicans like the Judd Greggs and the Mitch McConnells of the world who are basically talking to wealthy bankers and are trying to preserve the Federal Reserve in its collusive structure with big banks, but they want to remove the mandate for full employment so that the Federal Reserve has two jobs. One is to prevent inflation [inaudible] price stability. The other is to ensure full employment. Well, they don’t–. JAY: That’s currently what its mandate is supposed to be. STOLLER: That’s currently what it’s supposed to–it’s more like guidelines, which they don’t really pay attention to. But that’s what it’s supposed to do. And people at the Fed don’t like this, ’cause don’t like to provide employment, but they still sort of feel like they might have to occasionally do that. So the Republicans and the establishment Republicans want to get rid of the mandate to provide full employment, and they just want the Fed to focus on price stability. JAY: When you unpack what that means, "to provide full employment", given that the Fed sees one of its main objectives is to control inflation, then do they really mean by control employment making sure there’s enough unemployment? They see low unemployment as inflationary because it creates higher wage demand. So is their real objective unemployment, to make sure there’s a–you don’t get past a certain minimum unemployment? STOLLER: Yeah. I mean, and I think they want to suppress wages. And I point you to two examples. I mean, I’ll get to the Tea Party and what they think in a second. But Paul Volcker in the early ’80s–and this was in Bill Greider’s book Secrets of the Temple–used to carry around a list of union contracts and their wage demands. And he did it because he wanted to send a message to unions that wages were too high. And so he would know exactly what they were asking for. And when he had crushed the economy enough, he would know, because the list of union wage demands would change and would show that the unions had learned their lesson. And that’s what the Federal Reserve does and has done. And you can read the Federal Open Market Committee transcripts, which they release on a five-year time lag, and you can see this. I mean, they’re quite explicit about it. The 2005 transcripts just came out. And Dallas Fed president Richard Fisher was complaining in 2005 that American ports weren’t big enough to accept all the Chinese goods that wanted to come into America. And he was frustrated, because he was like, well, if we can’t import enough Chinese goods, then that’s going to mean that we’re going to have to make things here, and that’s going to put increased pressure on wages. And, you know, my question is sort of who are these guys actually working for, right? This guy wants to make everything in China because he thinks that’s going to help reduce wages here. I mean, they actually want to reduce wages, because they see that as their job. JAY: So, hence, various divisions amongst the Republicans. 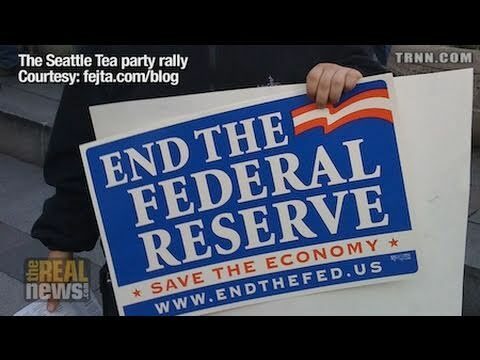 One you describe in one of your articles is the Koch brothers that are one of the bigger financiers of the Tea Party movement actually support the Fed, whereas much of the Tea Party–the Paul section and the Palin section–are very critical of the Fed. JAY: So–and then the old guard Republicans clearly support the Fed. So talk about–talk about these fracture lines. STOLLER: So the establishment Republicans want to–they supported the bailouts. They supported the Federal Reserve. I mean, there are cross-pressures, but they want to get rid of the mandate for full employment. So they essentially want to keep the system the way it is but make it a little bit more brutal. Then you have the Ron Paul types who believe that the Federal Reserve itself is contributing to financial bubbles and Fannie and Freddie are contributing to financial bubbles. And they actually take issue with the entire industrial policy of 20th-century America, and there they take a much more radical structuralist posture. So they see the kind of move that–enormous investment in housing since World War II as a government policy, and they want to get rid of that. And they’ve been consistent. I mean, Ron Paul was against the bailouts, he was against Fannie and Freddie, whereas you have people like Palin who–. You know, she was a supporter of the bailouts in 2008. And the people behind her, they are attacking the Fed, but they don’t want to audit the Fed. They–and they’re pretty clear about that. They’re running a ad campaign right now saying, we need to control the Fed because of this, they’re printing too much money. But they actually don’t want to audit it, ’cause they don’t want their buddies on Wall Street to be found out as borrowers. And so you see a big split in the Republican Party and the Tea Party because of that. But I’ll tell you something, the Ron Paul people were the driving force behind the Fed audit provision, but the Tea Party people really–you know, the Palin type Tea Party people didn’t have anything, really, to do with it at all. JAY: We’ll watch these faultlines as the House and the Senate proceed. There’s two faultlines to watch, and one is on the economy, and particularly focusing on the issue of the Fed. And then on foreign policy we’ll find out whether Rand Paul actually sticks to what he was saying up until the time he got elected, or at least up until the time he ran, where he said that–at one point in New Hampshire, me and my supporters have more in common with Kucinich and his supporters than with the Bush administration. But then, when he got elected, at least $1 million of that dough came from Karl Rove’s organization. So, hopefully we’ll talk more about this at another time. Thanks for joining us.